The last few months have gone very well for Microsoft and Windows 10 users. Following a huge number of Windows 10 security, privacy and other issues taking most of our news time in late 2015 and early 2016, it appeared the Redmond software giant had finally learned its lesson. The company not only started to talk about the privacy concerns, but also introduced several features that would help users take control of their own devices. One of the most annoying complaints included Microsoft downloading Windows 10 updates for you, without any consent from the user. We covered a number of stories where live telecast was interrupted because of these updates, or someone lost an important deal because their PC started to suddenly install Windows 10. 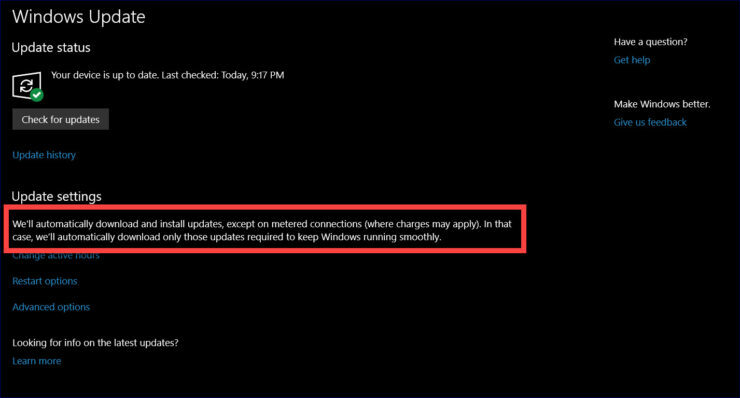 Now, almost a year later, it appears that Microsoft is bringing back at least one of these annoying features – downloading updates automatically even over cellular or satellite data connections. We’ll automatically download and install updates, except on metered connections (where changes may apply). In that case, we’ll automatically download only those updates required to keep Windows running smoothly. Now, what exactly runs Windows smoothly is a shady ground. We have no clarification from Microsoft on what this means. Does it mean that every Patch Tuesday update – which is considered to be essential for security – will add shocking amounts to a user’s monthly bill? We have reached out to Microsoft for comment and will update this story if we receive any clarification on whether this will be a part of the final release. It should be noted that the change has been spotted in a Preview build. Subject to change before the final release to the public on April 11, Microsoft has nearly finalized Windows 10 Creators Update. While it is unlikely for Microsoft to introduce any major changes, it could definitely remove this additional verbiage on automatic downloads – or, be ready for another wave of user criticism.